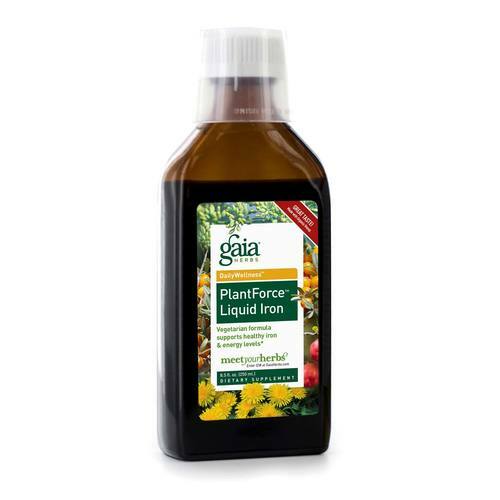 PlantForce Liquid Iron supplement from Gaia Herbs comes in an easy-to-digest liquid form that is taken either once or twice a day, depending on age. Warnings: Accidental overdose of iron-containing products is a leading cause of fatal poisoning of children under 6. Keep this product out of reach of children. In case of accidental overdose, call a doctor or poison control center immediately. If you are pregnant, have a medical condition or take medications, please consult with your doctor before use. Shake well before using. Refrigerate once opened and discard remaining contents after 30 days. Do not drink from bottle. Discoloration, which does not impact product quality, may occur. Notes: 100% vegan, no animal byproduct, tested for purity, free from pesticides and heavy-metal toxicity. Recommended Use: Adults take 10 ml twice daily. Children 6-12 take 10 ml once daily. Best taken within 30 minutes before meals. The customer reviews posted below are based on individual consumer experiences and may NOT necessarily represent what expected results will be from using or taking Gaia Herbs PlantForce Liquid Iron - 8.5 fl oz. These results may not be typical and you should not necessarily expect to receive the same results. Actual results may vary. Recommended by my Medical Doctor! This is great for those who suffer from Celiac disease, since the liquid iron absorbs better into your body. I was amazed how much better I felt after taking this and my iron levels returned to normal. No other iron supplement worked for me. My doctor recommended that I only take the liquid and he was happy to see those levels return to normal.